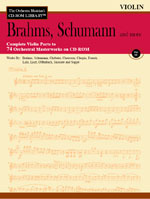 The Complete Trumpet and Cornet Parts to 74 Orchestral Masterworks on one CD-ROM. If these parts were purchased separately, this collection would easily cost $500.00 or more. Works are viewable and printable on either PC or Macintosh. No access codes or special software is required. The CD employs Adobe Acrobat Reader technology which is included on the CD. Contents: BRAHMS 4 Symphonies, 4 Concertos, 18 Hungarian Dances, 2 Serenades, Overtures, Variations on a Theme by Haydn, German Requiem, more (36 works); LALO Symphonie Espagnole; LISZT Faust and Dante Symphonies, Les Préludes, 3 Piano Concertos, Hungarian Rhapsodies, Mephisto Waltzes 15 works); OFFENBACH Orpheus in the Underworld Overture; SARASATE Carmen Fantasy; SCHUMANN 4 Symphonies, 2 Concertos, 3 Overtures; CHABRIER España; CHOPIN 2 Piano Concertos; FRANCK Symphony in D Minor, Symphonic Variations, Psyche; SUPPÉ Poet and Pesant, Light Cavalry Overture.